The Friendly Party Bag Co.: We Love .......... Pop - Up House!!! We Love .......... Pop - Up House!!! We love this. 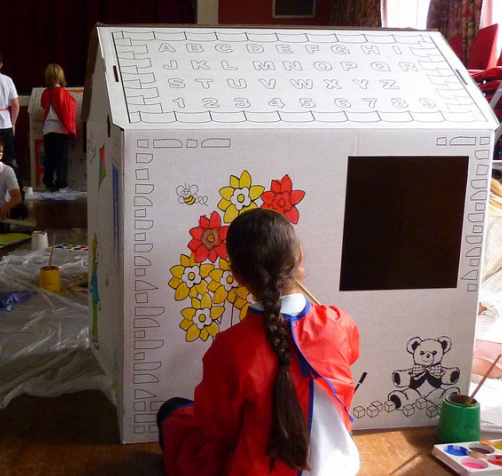 Do you remember having a Wendy house when you were little??? I do and I loved it. It was in the garden, as we were living in a two up two down terraced house at the time, and there was a lack of space! As time went by it would be all moulding and smelly, but I loved it!! Look at this for a fab idea! pop up house is the 2011 version of the plastic Wendy house of the 80's! 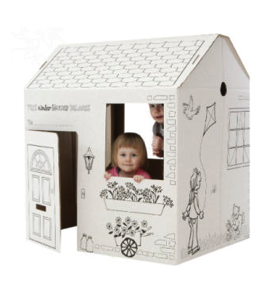 its made from 100% recycled cardboard and is easily constructed in less the 10 seconds!! It also easily slides away behind a sofa, or under a bed saving space and making it easily accessible so kids can play anytime! Also love the fact that it is black and white, so your little monster's can colour it in! The Friendly Party Bag Co's new ebay shop! Upcycled note books from infarrantly creative.